The Psalms have long served a vital role in the individual and corporate lives of Christians, expressing the full range of human emotions, including some that we are ashamed to admit. The Psalms reverberate with joy, groan in pain, whimper with sadness, grumble in disappointment and rage with anger. The church fathers employed the Psalms widely. In liturgy they used them both as hymns and as Scripture readings. Within them they found pointers to Jesus both as Son of God and as Messiah. They also employed the Psalms widely as support for other New Testament teachings, as counsel on morals and as forms for prayer. Especially noteworthy was their use of Psalms in the great doctrinal controversies. The Psalms were used to oppose subordinationism, modalism, Arianism, Apollinarianism, Nestorianism, Eutychianism and Monophysitism, among others. More than fifty church fathers are cited here from Ambrose to Zephyrinus. From the British Isles, Gaul and the Iberian Peninsula, we find Hilary of Poitiers, Prudentius, John Cassian, Valerian of Cimiez, Salvian the Presbyter, Caesarius of Arles, Martin of Bruga, Braulio of Saragossa and Bede. From Rome and Italy, we find Clement, Justin Martyr, Callistus, Hippolytus, Novatian, Rufinus, Maximus of Turin, Peter Chrysologus, Leo the Great, Cassiodorus and Gregory the Great. Carthage and North Africa are represented by Tertullian, Cyprian, Augustine and Fulgentius. Fathers from Alexandria and Egypt include Clement, Origen, Dionysius, Pachomius, Athanasius, Cyril and Poemen. Constantinople and Asia Minor supply the Great Cappadocians--Basil the Great and the two Gregorys, from Nazianzus and Nyssa--plus Evagrius of Pontus and Nicetas of Remesiana. From Antioch and Syria we find Ephrem, John Chrysostom, Theodore of Mopsuestia, Theodoret of Cyr, Philoxenus of Mabbug, Sahdona and John of Damascus. Finally, Jerusalem, Palestine and Mesopotamia are represented by Eusebius of Caesarea, Aphrahat, Cyril, Jacob of Sarug, Jerome and Isaac of Nineveh. Readers of these selections, some appearing in English for the first time, will glean from a rich treasury of deep devotion and profound theological reflection. 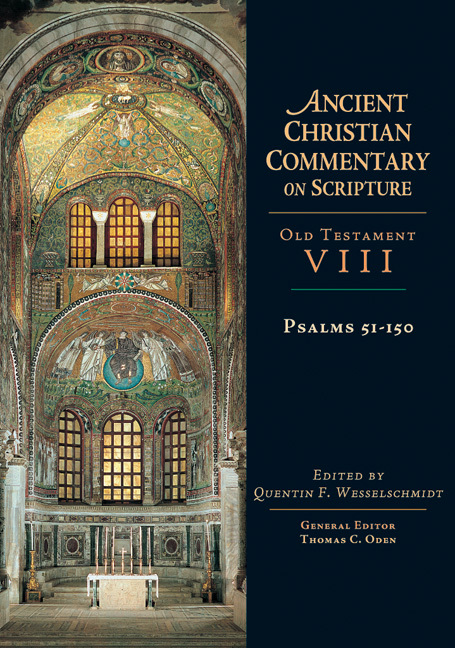 "A valuable resource for those interested in the history of Christian interpretation of the Psalms." Quentin F. Wesselschmidt (PhD, University of Iowa) is a professor of historical theology at Concordia Seminary in St. Louis.